The garb of a wanderer is typically simple, comfortable, dependable, and usually little else. Those are three words that aptly describe the Wanderer Pants. Made from quality materials, these pants will hold up to rigorous use and motion. These pants are made from a soft, suede-textured material that replicates the look and feel of real suede in a fabric that is much lighter than suede. 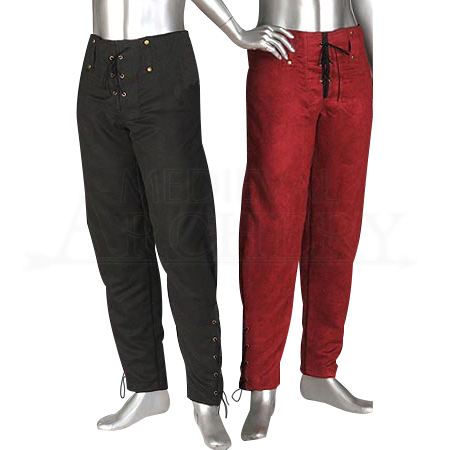 The end result creates a pair of pants that is attractive to look at as well as comfortable to wear. These pants feature belt-loops around the waist, and fasten using laces along the fly. The legs are full-length. The legs are also comfortably fitted and taper gently to the natural shape of the leg. The bottoms of the leg lack a cuff but can be tightened using laces. These pants have a small measure of adjustability but should always be ordered as close to fitting as is possible. These sleek pants are also available in a wide assortment of attractive colors. All pants are not created equal. To prove that statement, look no further than the Wanderer Pants. After a couple hours of wearing these comfortable pants, you will find that they have become an instant favorite.